November, 2018: Participation in Mahalla Festival, Fortress Builders, Valletta. 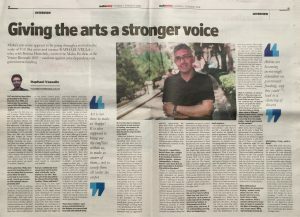 Interview in Maltatoday, 12 August, 2018. Artist and Curator Raphael Vella on Malta’s Pavilion at the Venice Biennale. The 4th edition of the Curatorial School was held between 28 August and 1 September, 2017, at the Valletta Campus, University of Malta. Directed by Raphael Vella, the school is a weeklong educational project. The 4th edition featured intensive workshops, experimental pedagogies and presentations. The curators talk about their plans for the Malta pavilion. Interview with Irene Biolchini on Artribune. Read more. The artists whose work will be shown at the Malta Pavilion of the Venice Biennale have been selected. Read here.